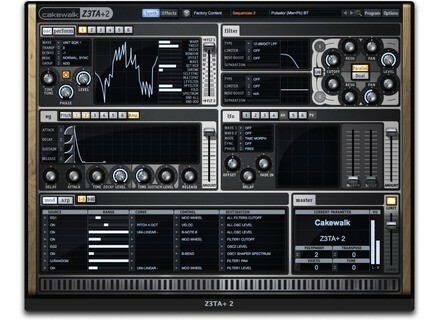 Z3TA+ 2, Virtual hybrid synth from Cakewalk in the Z3TA+ series. 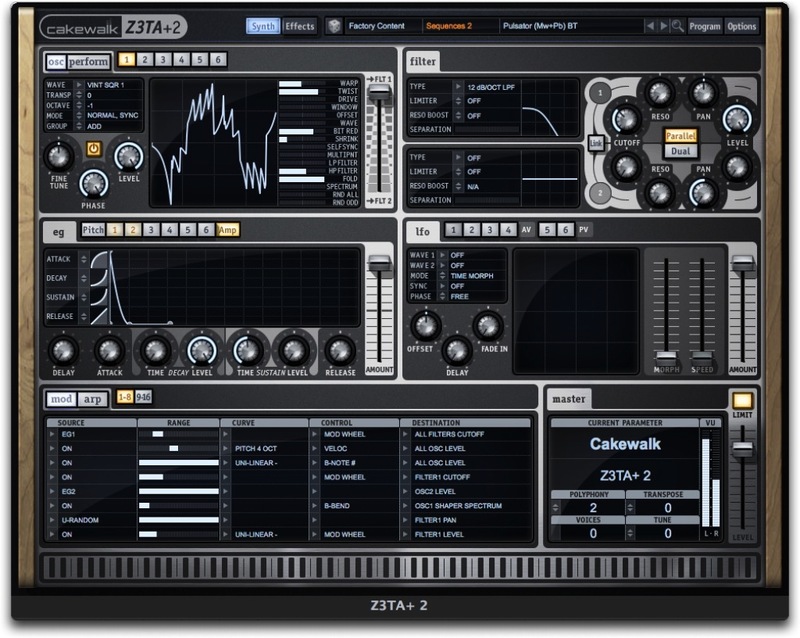 Cakewalk announces that the Z3TA+ 2 Waveshaping Synthesizer is now available for Mac. Waveshaper is now an integral part of the Oscillator section with 4 new Waveshaping modes. All Waveshapers are now accessible via the modulation matrix. 4 new Filter modes bringing the total to 14 filter modes with separation control for tweaking resonance peaks on stacked low-pass and high-pass filters. Both filters are accessible and visible simultaneously. New Graphically controlled Envelopes providing visual representation of all envelopes, mouse controlled ADSR, and new naming and interface arrangement. New Graphical LFOs show the resulting LFO shapes when morphing between two waves and the new AMOUNT fader scales an LFO’s intensity. New Graphical Arp provides visual display of Arp patterns, including 100 new patterns from Dance MIDI Samples. 50 new ‘Gate’ patterns, also from Dance MIDI Samples. Apply trance gates to synth pads and leads while Humanize and Swing controls are designed to increase total Arp flexibility and expression. Effects enhancements include: Simple drag and drop routing of all effects, new Hypertube distortion algorithm, and distortion module routing (apply to filter busses and master section or both simultaneously). Expression is enhanced with Adaptive Pitch Bend which allows for the bending of notes within the key and mode performed; automatically learns key based on performance. All Waveshapers can be mapped to the modulation matrix. Z3TA+’s has been improved with a new ‘HIGHEST’ SRC algorithm designed to provide smoother, more accurate interpolation of wavetables.